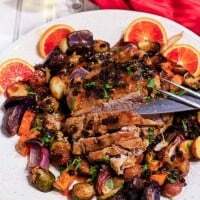 A succulent pork roast dripping with the brilliant red juice of the blood orange, the tang of good mustard, the herbal earthiness of rosemary, and the sweetness of currants… Instant Pot Pork Roast With Blood Oranges is an elegant and approachable main dish to grace the table shared with your Valentine (or any time), and prepared in less time with your IP/pressure cooker! One of my favorite aspects of living in south Texas is the beautiful citrus. The cities and towns are surrounded by groves, and the variety is amazing! January brings blood oranges, and their gorgeous vermilion hue is perfect for Valentine’s Day… Don’t you agree? I love pork and citrus. When I started putting this recipe together in my mind, pork seemed the perfect protein with the citrus. I often google ingredients – partly for confirmation that my idea isn’t too far out of the main stream, but also to make sure there aren’t already a million recipes out there. 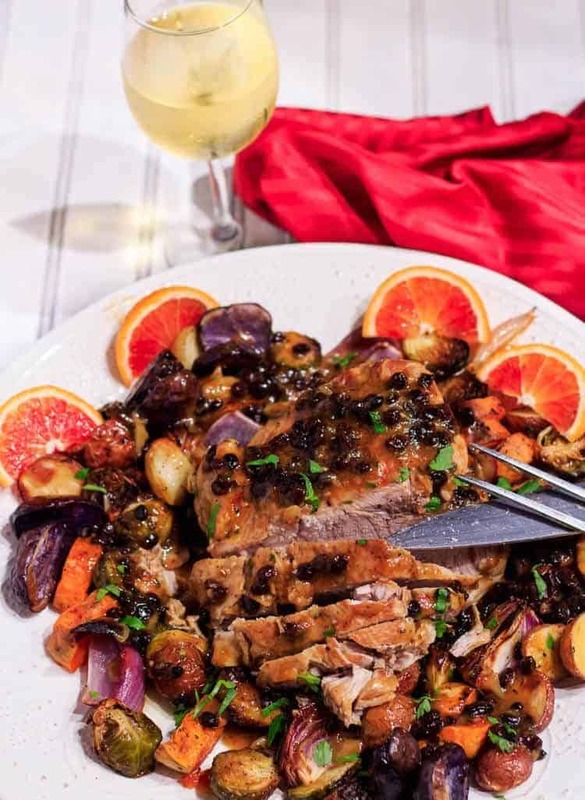 The top result for pork + blood oranges is the Roast Pork Loin with Blood Orange Mostarda from the Food Network Kitchen. If you have followed me for any length of time, you are probably aware that I rarely adapt a recipe, but if I do, credit is always given. This is a gorgeous recipe. I feel confident that were you to follow the Food Network recipe, you would achieve amazing results! So, the Roast Pork Loin with Blood Orange Mostarda provided the inspiration for my Instant Pot Pork Roast With Blood Oranges, though they are 2 very different dishes. I chose to use my Instant Pot rather than my oven. The sauce is created with blood oranges and garlic that roast with vegetables and the cooking liquid from the pressure cooker. My sauce is more tart than sweet (I reduced the amount of sweeteners), and it is slightly thickened with cornstarch rather than cooked down to a syrup. I used the roasted blood oranges in the sauce, and garnished the plate with fresh oranges. The brussels sprouts, sweet potato, and multi-colored new potatoes paired well with the orange sauce, but feel free to make substitutions. The roasted vegetables cook in about the same amount of time as the pork… A truly elegant meal in under an hour! See more in the Pressure Cooker | Instant Pot category in the Recipe Index! A succulent pork roast dripping with the brilliant red juice of the blood orange, the tang of good mustard, the herbal earthiness of rosemary, and the sweetness of currants... Pressure Cooker Pork Roast With Blood Oranges is an elegant and approachable main dish to grace the table shared with your Valentine, and prepared in less time with your pressure cooker! Preheat your oven to 425 degrees (400 convection roast). Add the olive oil to the pressure cooker either on medium high cook top or the "brown" feature on an electric. When it's hot, add the pork and brown on each side. Add the garlic, and using tongs, move turn it over to distribute the garlic. Whisk the blood orange juice and zest, chicken broth, white wine, rosemary, salt and pepper together and add to the pressure cooker. Lock the lid, and set to full pressure (if manual cook top model) or the meat setting. My adjustment to "medium" cook time gives it 30 minutes, and this was perfect. While the pork cooks, prep the vegetables and oranges. Drizzle with olive oil, and season with sea salt and fresh ground pepper. Roast 30 to 40 minutes until vegetables are tender and browning. 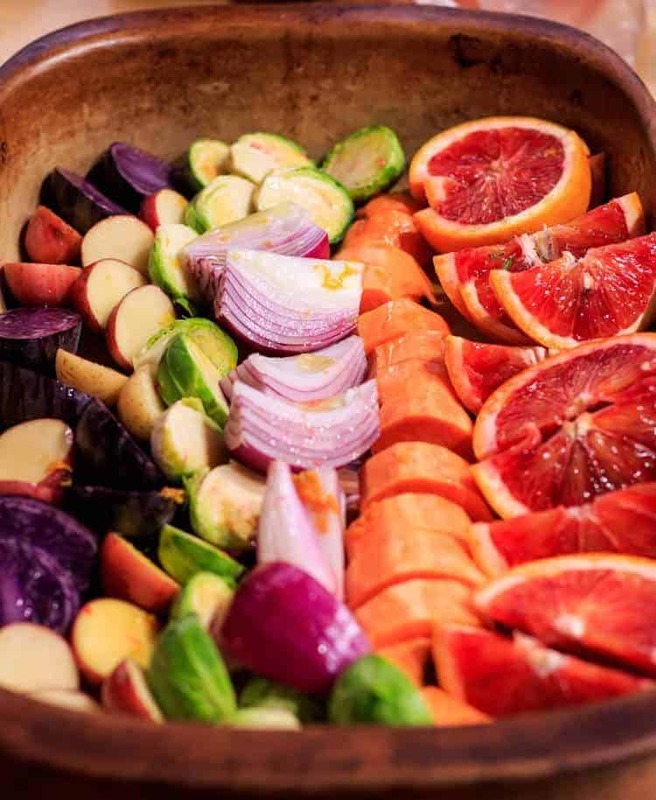 When they're ready, turn off the heat, remove the oranges and garlic, and leave the vegetables to keep warm in the oven. You may wish to leave the door ajar. The sauce only takes a few minutes. When the pressure cooker is done, do a 10 minute natural release (no heat), then fully depressurize and open. Remove 1 cup of the cooking liquid from the pot, and strain. Replace the lid to keep the pork hot until ready to serve. Add the strained cooking liquid to a small saucepan on high heat. Add the white wine and garlic cloves. Cook until reduced by about half. Whisk the juice from the roasted oranges together with the cornstarch (juice needs to be room temperature not hot). Add to the saucepan. Stir until bubbly and slightly thickened. Add the dijon mustard, agave nectar or honey, and currants. Stir well to combine. Taste for seasoning with sea salt and fresh ground pepper. Arrange the vegetables around the roast on a platter. Drizzle with the sauce. Garnish with chopped flat leaf parsley if desired. When roasting vegetables, you want to make sure the sizes are somewhat uniform for even cooking. You don't want any crunchy potatoes! Feel free to substitute or add vegetables according to your preferences. Keep in mind length of time to get them all cooked. I find the combination of potatoes, sweet potatoes, and brussels sprouts works great. You don't need the entire bulb of roasted garlic. Keep the extra cloves for smearing on bread. You can store them in a zip bag. Roasting gives the garlic a more mellow, sweet, complex flavor. You can skip this step if you wish. Nutrition estimates are approximate. 32 ounces of pork is approximately 5 ounces per serving. We try to stay in the 4 to 6 ounce range of protein per serving. The amount of sauce depends on how much you cook it down, and how much you pour over the dish. Macronutrients: 34 g protein, 39 g carbohydrates, 21 g fat. Now that's a pot roast!! What fantastic ingredients and the addition of blood oranges is genius! I would never have thought to add oranges to pot roast. Love it! Pork and citrus go so well together... a perfect pairing! Thank you MJ! So I was going to make a pork tenderloin with blood orange sauce from epicurious that I've made a bunch of times before. I thought that I would have some sweet potatoes and some Brussels sprouts on the side. But it just seemed ho-hum so I turned to the trusty internet and found this recipe. 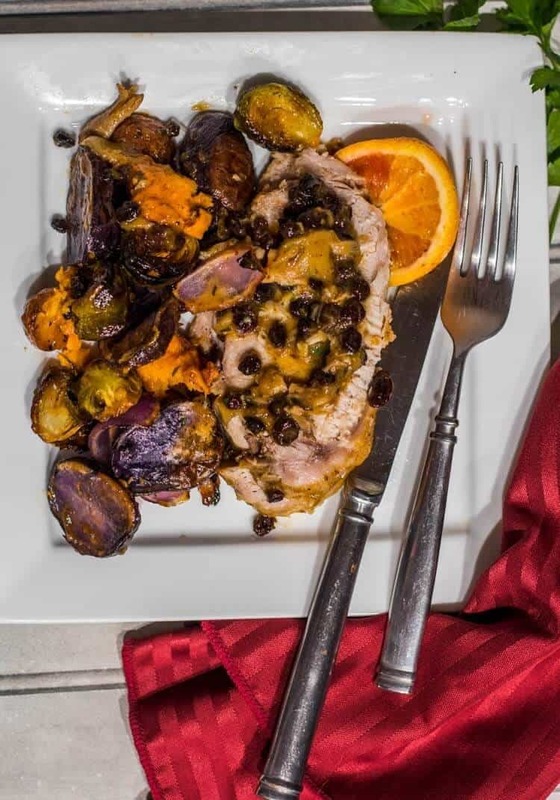 It had the pork, the blood oranges, the sweet potatoes and the Brussels sprouts all in one. Plus it was made in a pressure cooker which I have and love but don't use often enough. The sauce really makes it. One thing to note... Since the pork isn't done in the oven, it comes out very pale. At first I was concerned that it might be tough and dry. However, It was tender and juicy. Go ahead try this recipe. Super yummy! Thanks Care! I do brown it prior to pressure cooking it, but it doesn't keep the color like a roast pork loin does. I'm glad you liked it! 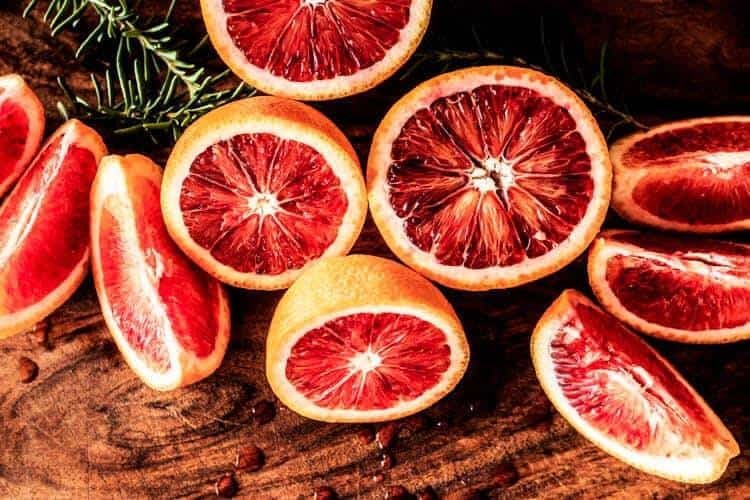 I am totally obsessed with blood oranges too! I was given a pressure cooker for my bridal shower 18 years ago and have only used it 3 times. My MIL gave it to me because her mom made everyting in it. I am sad to say that I am scared that it will explode on me so i tend not to use it. This recipe will definitely make me change my mind though! Once you get used to using one, you will love it Jennifer! The modern ones don't explode... I promise!